I have mentioned before when my wife and I started wine making we used an empty cabinet in the kitchen. We quickly out grew the cabinet. When we moved the last time we were blessed with a closet that is working out like a dream. The closet is a standard coat closet in our mud room. For those of you that don’t know what a mud room is, it is a small room by the back door where the washer and dryer are. At first we only used the floor space and the top shelves…as with most hobbies we accumulated more stuff and I recently put in a simple shelf/table. The journey began when my wife made me a couple signs for a gift. 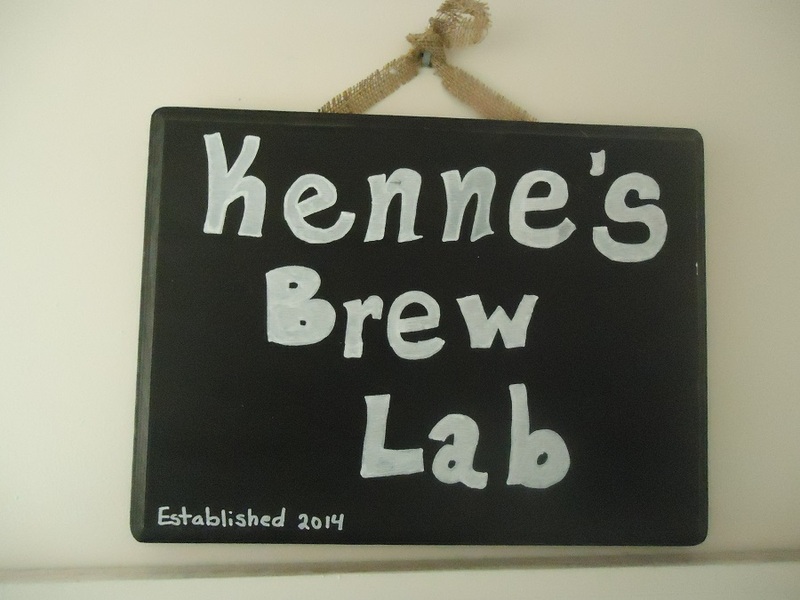 I should mention we don’t really brew. We use no heat in the process to keep things as simple as possible and we feel purer. One day we will employ heat but for now it is low on the priority list. The sign made us feel legit. The other sign is more functional. 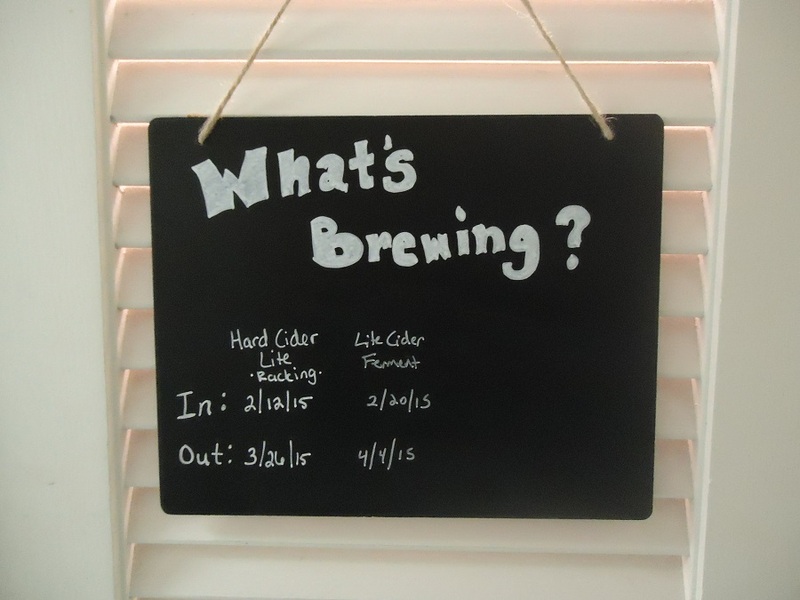 With this sign we keep track of what is in process. 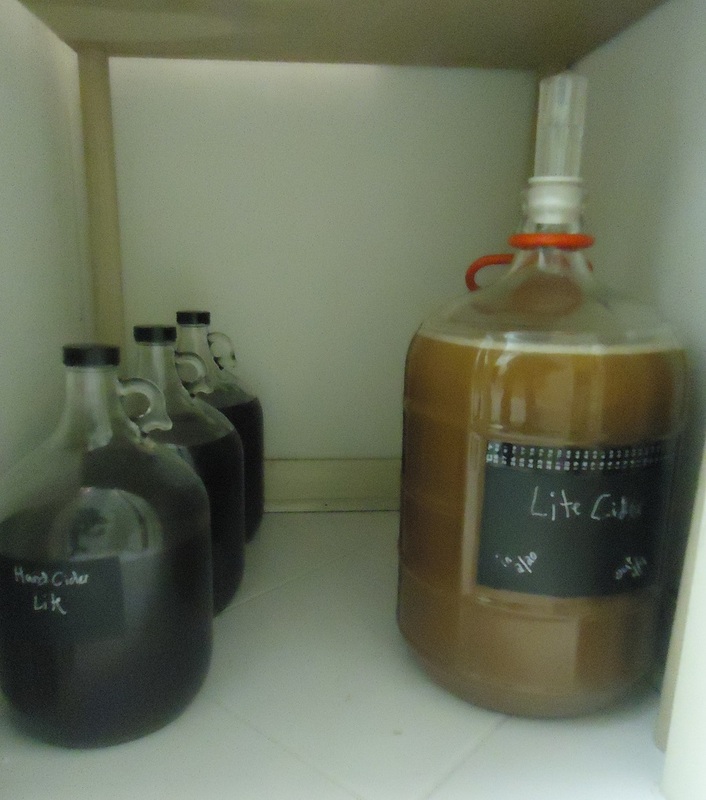 When a batch was started, when it will be done and if it is racking or fermenting. We also label the flavor to keep it straight. This information is also put on the individual bottles. Both signs were spray painted with chalkboard paint. The paint and the raw wood boards were purchased from a favorite haunt…Hobby Lobby! It is truly amazing what you can find at a Hobby Lobby. I have even seen our carboys there; though they are more expensive. 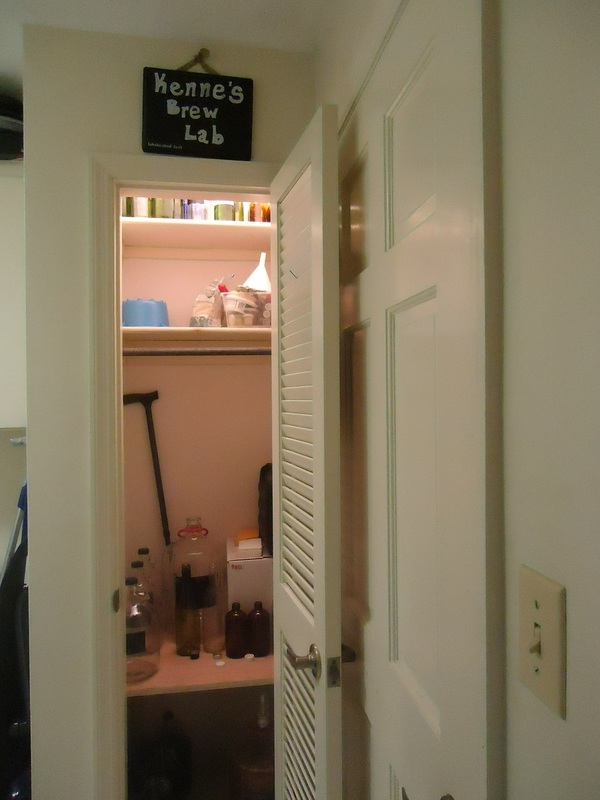 The closet is about 2′ wide by about 21″ deep. More than enough space for now. Though I have future plans, if everything goes well, that will eventually require more of a small room! 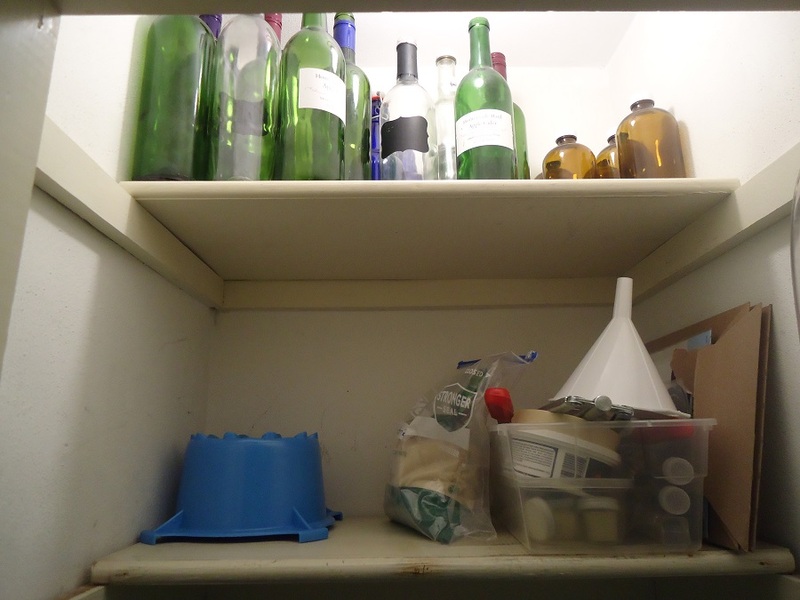 The top shelf is where we keep used bottles. The used bottles are usually used for over pour or when we know we will consume the wine in short order. Most of these bottles are screw top or bottles from our Bernard Jensen’s Apple Concentrate. The next shelf down is where we store labels, corks, tools, extra sugar and any other tools. We hang hoses from the hooks just on the right. The hoses are hidden from view behind the door jamb. The bottom shelf I made. The shelf is simple: a piece of 3/4″ cedar, four screws and four – 2′ dowels. I built the shelf in the garage, disassembled it and reassembled it in the closet. It is really more of a table. 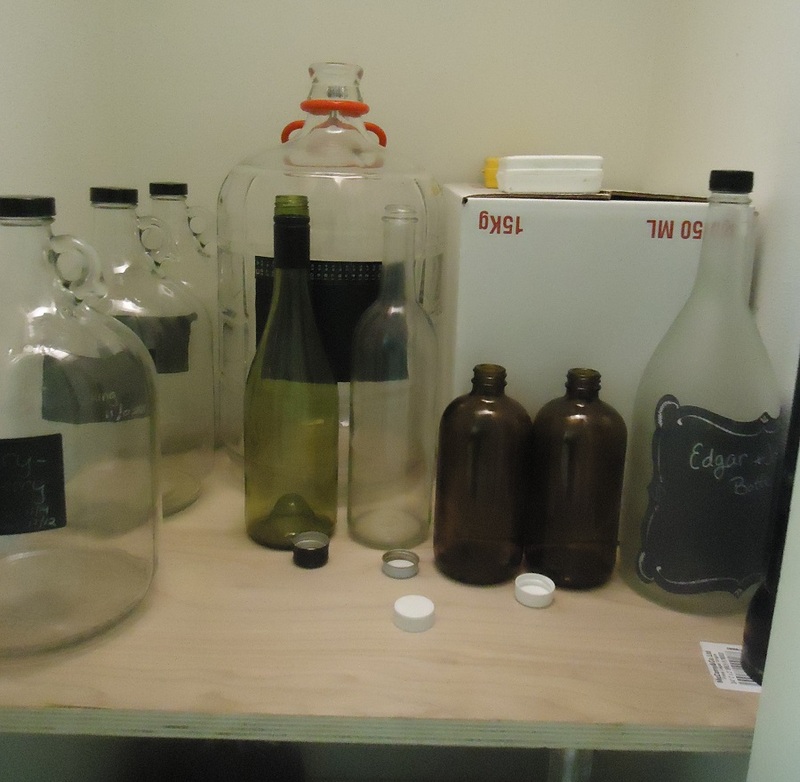 We store empty carboys, gallon bottles and new cases of bottles here. 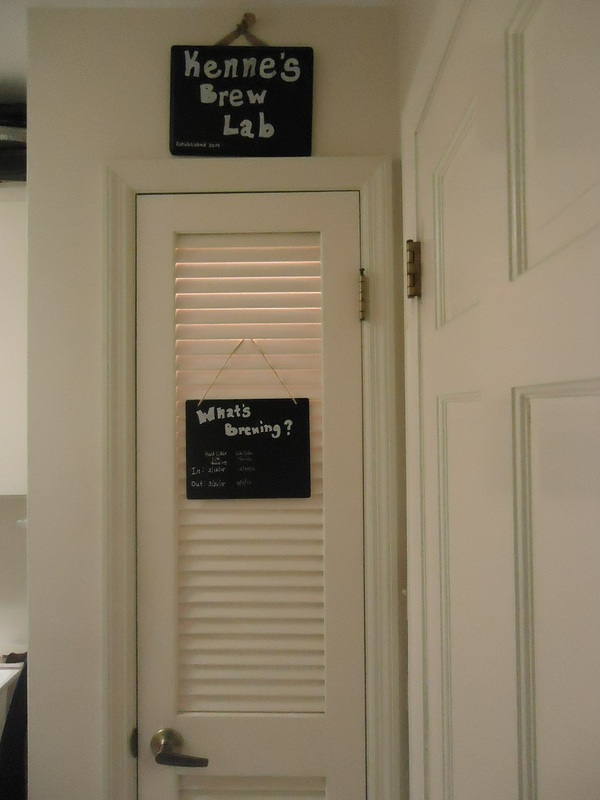 The floor of the closet is where all of the science happens. We ferment and rack here. Since the shelf/table above is the same depth and width as the closet there isn’t as much light here…perfect for the process. We can fit two three gallon carboys and six one gallon bottles here. In case you are counting that is 12 gallons in process. If done right it is about 12-14 bottles every three weeks. Well that is a look behind the scenes. I hope I showed how a lot of wine can be made in a little bit of space.